Credit card fraud costs businesses billions of dollars and wreaks havoc in the lives of its victims, and the crime is on the rise. Ten million victims fell prey to identity thieves in 2008, up 22 percent from 2007, according to the most recent estimates available from Javelin Strategy & Research, a financial-services consulting firm. 1. Writing "Check ID" instead of signing a credit card protects me from fraud. Your signature on the back of the credit card gives merchants a way to verify your identity. Credit cards that are not signed--including those that say "Check ID"--are considered invalid. 2. I need credit card fraud insurance to protect me. These pricey policies, marketed for a few hundred dollars, are scams. Under federal law, your fraud liability on credit cards is limited to $50 per card before you report it missing, and many cards have zero liability policies, so you owe nothing if the card is stolen. 3. I'm safer using a debit instead of a credit card. 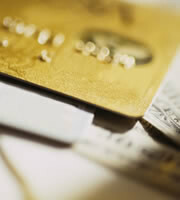 Credit cards provide better protection than debit cards if your account information is stolen. A thief who steals your debit card and PIN could empty your checking and savings accounts. You could be charged overdraft fees, bounce checks, and be short on cash while the bank investigates. 4. I can avoid credit card fraud if I don't shop online. It's true that your information can get stolen online if you're careless, such as using your credit card on a public computer or shopping from a questionable Web site. But much identity theft stems from old-fashioned thievery--pick-pocketing or swiping account information from mail boxes or trash barrels. 5. As long as my credit cards don't get stolen, I'm safe from credit card fraud. Thieves can also steal your personal financial information, fill out phony credit card applications, and run up charges in your name, which has the potential to cause greater harm because it may take longer for you to detect. Of identity theft victims who had new accounts opened in their names, 25 percent did not discover the fraud for more than six months, versus just 3 percent of identity theft victims who experienced the misuse of their current accounts. You're entitled to free copies of your credit reports once a year--take advantage of the privilege to ensure no fraudulent accounts have been opened. 0 Responses to "Five Credit Card Fraud Myths"